Note: only six charter memberships are left as of EOD Thursday. I’ll keep this going until they’re gone. Congratulations to E.J., P.B. and T.J. for locking in today’s annual rate for the life of the site! Quick, which one of those wasn’t completely predictable? Exactly. Even so, the market just fell out of our channel. 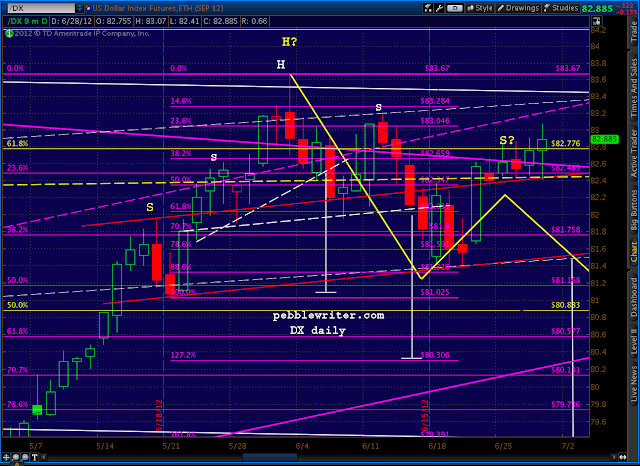 I can live with an intra-day departure as long as the little H&S pattern doesn’t play out (1309ish.) Keep an eye on this guy. BTW, JPM’s trading losses are probably much bigger than $9 billion, too. If you haven’t read it yet, this might be a good time to peruse The Wipeout Ratio. JPM has $78 trillion in derivatives. Even $9 billion is a pittance — 0.011% of the total. I have to think they experience $9 billion swings every time Jamie Dimon gets the runs in his silk boxers. 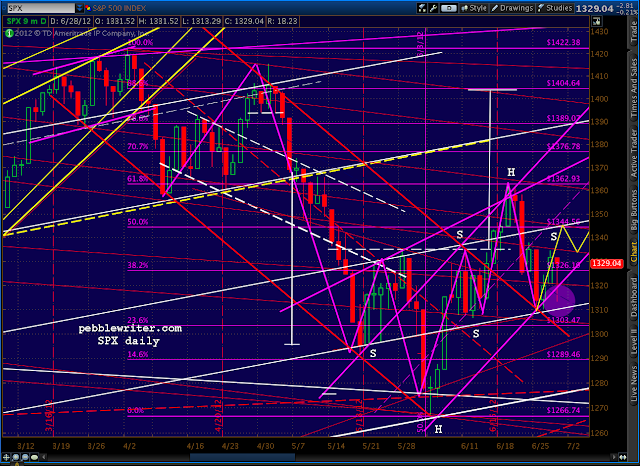 While we’re at it, the 1309 SPX level looks like it’s probably linked to 83.182 on DX. 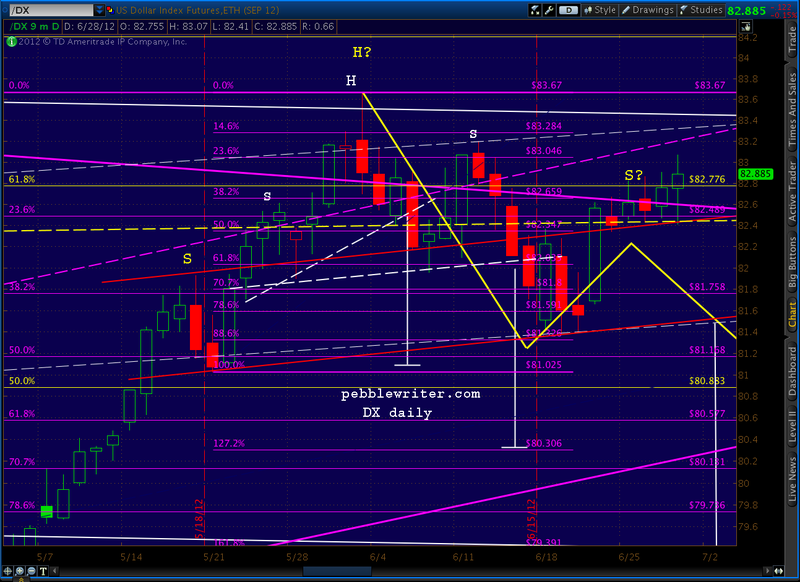 As we discussed above, 1309 is the area where a H&S pattern completes on SPX. 83.182 on the dollar is the area where: (1) a Gartley completes, and (2) the previous H&S pattern starts to be compromised. A lasting push above 83.182 (or below 1309 on SPX) potentially changes the picture. Stay tuned. DX got up to 83.07, and closed at 82.91 — leaving a spinning top on the day without exceeding the previous presumed shoulder that should see DX sell off substantially over the coming days as stocks move up. The yellow line marks the forecast I last updated on June 10 [see: Currents, See?]. Check in later for tonight’s post on the dollar. I’ll have a complete discussion and updated forecast. Wake up wake up! Big move up everyone. Good morning! Targets for this a.m.? outside of looking at the 1309 level – does either gold’s lack of positive trend or the continuing uptrend of the dollar concern you at this point? or is that mere noise in the grand scheme of the harmonic patterns? oh my bad – i didn’t even see your dollar chart posted. The Wipeout Ratio is a great post to keep in mind amidst all the noise. And, a great topic for bringing a dinner party to a screeching halt. I have the Kate Spade-shaped dents in my shins to prove it. Putting a definitive point on it PW, if you have longs, stop below 1309 is a MUST. Correct? 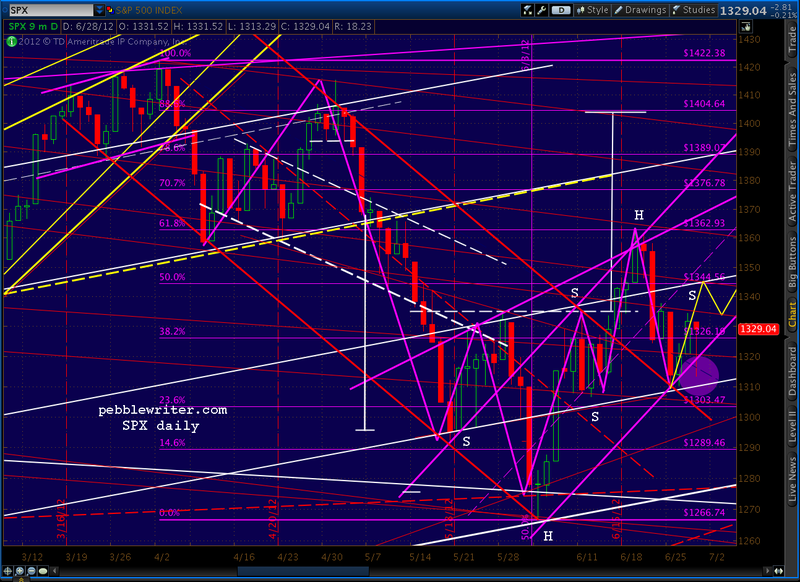 Looks like that 1315 level is offering support again.